Oral hygiene has been a crucial part to our lives over recent years, with companies inventing and creating innovative, and healthier ways, to protect our gums and teeth. 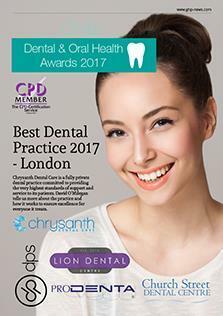 GHP Magazine has created the Oral Health Awards 2017 to recognise and acknowledge those companies who support the welfare and wellness of our gums, and those who are truly dedicated to providing the best service for their clients and customers. The aim of the Oral Health Awards 2017 was to showcase the achievements of companies associated with this important sector, from the leading dental practices to those companies offering innovative technologies and solutions to make sure they stay ahead of the game. All companies associated with this market will be considered, the only criteria is that they are committed to providing the very highest standards of care to patients and clients they support. Winners can rest assured that their success is truly deserved, as we have employed a thorough research process to make absolutely certain that only the best receive one of our prestigious accolades.